The whole region of Serres and its greater area in Central Macedonia, Greece are privileged for its natural beauty and the rich flora and fauna in the beautiful landscapes of mountains, rivers, lakes and caves that are all worth to see and explore. Visitors have the opportunity to try various summer and winter activities such as trekking, mountain biking, winter sports, racing and rowing. The city of Serres and its greater area provide visitors with important museums and archaeological sites such as the ancient Greek city of Amfipolis and the Roupel Fortress which are the most significant. Lake Kirkini with its natural wetlands provide spectacular nature with its unique setting. Furthermore, Serres prefecture is ideal for religious tourism as many old monasteries and Mosques which have been built in the last 5 centuries that are worth to visit and admire. After a day of sightseeing & activities, Philippos Xenia has the perfect facilities for you to unwind and gather your energy for the next day. 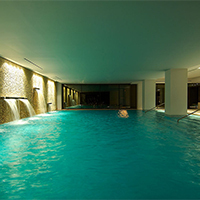 You have access to the swimming pool, spa, gym & massage center.